The Unbranded Espadrille Man hates hotels. He has no interest in swanning around a pool or spa, looking at or being looked at by other hotel guests. Instead, he rents gîtes – “Much less pretentious than a villa” – reads about local history and potters about munching marmalade on toast. The Tod’s Driving Shoe Man never holidays in the same place. 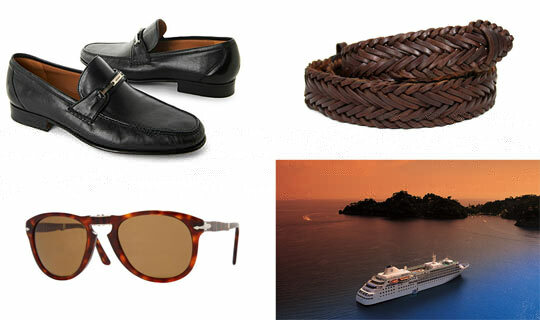 “Why bother?” he says to his wife “if we can afford to go anywhere we like?” He started his Tod’s collection in Capri, where he noted everyone at the Quisisana Hotel wearing a pair with some easy fitting linen chinos; since then, he has credited himself for taking Italian style to other parts of the world. He engages with Tod’s attractive store staff needlessly and with overbearing familiarity, touching the ladies’ hair with his sovereign-ringed, cigar-scented fingers; “I must be your best customer” he grins. The Jil Sander Sandals Man calls himself a backpacker; but it is a claim that wears thin for his bright-eyed twenty-something female travelling companions, each time he turns left after the jet bridge. It was on a humid night in Borneo, under the stars, that Daniela discovered his discarded Jil Sander sandals outside the tent in which he was ‘wooing’ Alejandra. 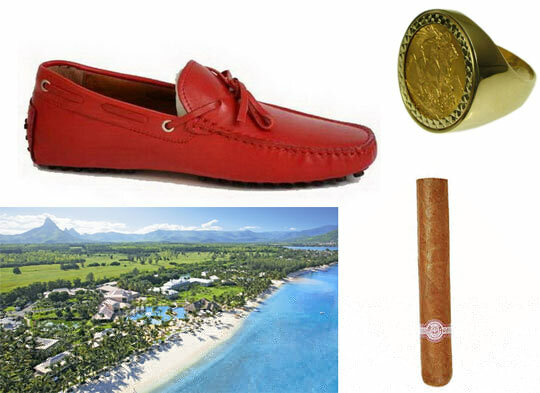 And it would not be until East Timor, when Alejandra was excluded from the evening’s merrymaking, that his Goyard washbag and Vuitton wallet, packed with priority memberships and private bank cards, would expose him fully. The Stemar Ascoli Man is a quiet, somewhat contradictory individual; a family man who stands alone on the shore; a wealthy ex-accountant with a flair for style. He once claimed he never wanted to retire, and as he approaches the end of his fourth retirement year – spent aboard Silversea Cruises and Caribbean beaches where he browned like a nut – he contemplates the uncomfortable truth that he might well have been right. A smart, well-dressed septuagenarian with slicked silver-hair, high-rise tailored cream linen trousers from Brioni – which he always wears with a woven leather belt – and fully-fitted shirts, he is a Saga poster boy. Wearing his Persol sunglasses to dinner, he looks vaguely Mafioso – helped by his Stemar Ascolis – and it is in public that his quietness commands the most respect. He talks with his son about setting up a business using “spare cash”, but is rebuffed by his heir who tells him to enjoy his “earned retirement.” He shuffles about Dubrovnik and Corfu behind his ebullient wife and her newly-made cruising friends, ignoring her pleas to “mingle with the men” who have disappeared into a tavern. Instead, he wanders into millineries and antique shops, asking the local businesspeople about current trade and cashflows. Winston’s Sartorial Stereotypes series has become my favourite part of Mens Flair. Every time a new one appears, I re-read the old ones. Winston, the characters you create are novel-worthy. I want to read more pretentious adventures of the Jil Sandler Sandals man. I feel sorry for the Stemar Ascoli man, purposeless and regretting retirement. I want to see the brash Tod’s driving shoe man get a humbling comeuppance. What can you tell us about the Sperry Top-Sider man? “sovereign-ringed, cigar-scentedfingers” the Todd’s man give me the creeps a little bit – perhaps he was designed to? Greetings Winston! As always happends with Sartorial Stereotypes postings my brain keeps thinking about stereotypes like the middle age man in Chuck Taylor’s facing the “aging punk dilemma”. I’m 38 and bought Chuck Taylors recently. I’ve never cared for them until recently. I hate big bulky sneakers, which are the norm in the US. And yeah, I was a teenage punk. I also wear slim fit 511 levis, because I’m skinny and Straight or Regular fits are too big for me. So, 38 , Chucks and Slim jeans, am I headed down the wrong path??? Thanks for the pleasant comments. Glad the series is enjoyed! Sperry Topsider Man…I can see him now.